Galco International has made the most copied, comfortable, and versatile shoulder holster systems since 1970. Not everyone, however, needs a shoulder holster that will hold up to 80 hours a week of use... for decades! If you want a genuine Galco International shoulder holster system for part-time or occasional carry, the Classic Lite is for you. This complete system-holster, single ammo carrier and JRH harness-gives you the comfort and versatility of Galco's professional shoulder rigs. They use the same patented and trademarked connectors and hardware to achieve the same great fit and design. Instead of full grain steer hide they use orthopedic suede, which has a proven track record in the Jackass harness. By avoiding the many hours of handcrafting needed to make a steer hide holster, Galco can offer you a very reasonably priced alternative. And you thought an ill-fitting nylon rig was the only affordable choice! Holster overly tight. Mag pouch way to large for PPK mag. Sloppy fit, even on tight adjustment. Nice fit for my Colt Defender. It allows me to carry in condition one. Haven't tried it yet, need the tie down straps. I thought those came with the holster. I'll give them a rating when I do. Thanks, Leo Dollarhide. Love it. Gun and mag sets close easy to conceal. Couple of my orther guns want now. Fits great and very comfortable. Decent piece of gear. no problems so far. tired of wearing duty weapon on ankle, so opted for a shoulder holster. Good product from Galco, but its uncomfortable, problem I have is the cowhide material catches and drags and pulls the shirts and constantly having to readjust the shirt and or shoulder holster. If it was smooth leather would have that problem such as in their Miami Classic holster styles. Fits my Bersa .380 Thunder CC. Matter of fact perfectly I couldn't be more pleased. I do so much driving and my duties cause me to dress in a suit everyday of the week. VERY comfortable. Took a little patience getting it together but completely satisfied. Why this rig is not equipped for 2 mags holders is a total miss. You have a G43, 6rds, and one extra. Need min of 2 extras. It fits nicely under several different jackets. It's invisible, comfortable, and readily accessible. I had a very hard time putting it together, though. The leather straps were almost too wide and too thick for the hardware. I needed a pair of needle-nosed pliers to get everything together properly. Once I got it together, it met all of my expectations. Both holsters fit. My wife love the one I got for her. Great quality and excellent service. Shipping was ultra fast I will definitely buy again from this company. I don't care for it. It is very difficult to "break in." I kept checking the package to make sure it fit my pistol. After several days of stretching and tugging with pliers I finally got it to snap shut. It is presently in my safe, with my pistol in it, hoping it will stretch. I would have bought the more expensive holster if it had fit my pistol (Glock 36) but it wasn't offered. This holster may be a waste of money. Time and more stretching will tell. Fit is good and comfortable. Love the way it fits, and the price was right. 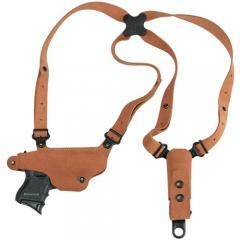 You can select "Glock 26" and "Springfield XDS" for this shoulder holster. Will an H&K P2000 fit in this holster? The galco cl212? Yes, the part no. is CL428. Just unclear on what "hand" I need to order. I am right handed and therefore the gun should be on my left side. Is it the "right hand" one I should order? Can Part #MICHX (spider harness) fit on the Galco classic shoulder holster system? Unfortunately the Classic Lite will not fit the LC9. We recommend the 'Uncle Mikes Pro-Pak Nylon Horizontal Holster' (Medium Autos 3-4" bbl).